and this is my grandmother holding down her usual spot in the rocking chair across the room. 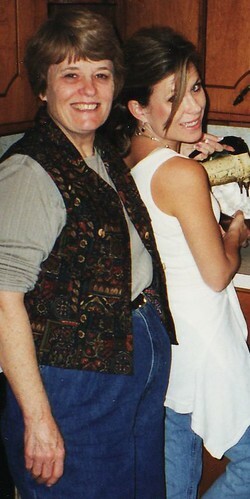 I'm pretty sure this was her last Christmas - 1999. She was 89, and she died the next May. 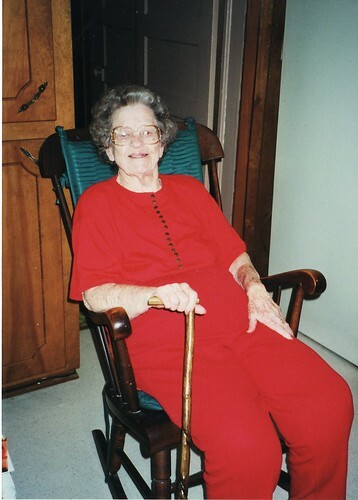 She was not actually living at home by this time - she was living in a nursing home. But my mother and Art came up every couple of weekends - for several years! - and took Grandma home for the weekend. Or in this case, for the holidays. I suppose all those free shipping offers we were discussing before do work, because I spent about $150 (total) at two different online stores today, both of which had free shipping. In both cases these were things I could have bought at stores in the area - in Houston, at least - but I thought, well, the shipping's free, so I might as well save myself the trip! (Although in fact, I am still planning one trip into Houston to shop before the holidays are over, in any case. It wouldn't quite seem like Christmas if I didn't go.) One of the gifts is for my mother-in-law, and it's being shipped to me, so I'm still going to have to turn around and pay to have it shipped to her, which kind of negates the savings, there. But there were two gifts in there, that was the problem. I am assuming they wouldn't ship to two different places for free. Although you never know - maybe I should've checked! The optometrist visit was because I lost my prescription sunglasses, and then somehow I managed to lose my back-up pair, too. Interestingly, it's the first time since I started wearing the prescription sunglasses 10 years or so ago that I've lost any of them. But I was intending to get another pair this year, anyway, so I just have to do that a little sooner. (And I have plenty of money in my medical flex account, so I can pay for it out of that.) I ended up getting Ray-Bans, which is also a first - but not the traditional Ray-Bans shape. I didn't even try that shape on, but I'm fairly sure they wouldn't've have suited me. Besides, I would feel like a cop or something wearing those! what is sad is that I got frustrated with my laptop, wondering why I couldn't click the cut tag. I need to put the internet down for a while. Reality is beginning to fog. oh, yeah, the real one was fine! but the bold parentheses in the Pizza Hut quote had me thinking it was a cut-tag, because Livejournal has eaten my brain.